This exhibition presents approximately fifty works, primarily dry-point etching and woodcuts, by Wellfleet print-makers from the private collections of Arthur N. Gilbert and Tom Broker. Notable artists include Peggy Bacon, Clare Leighton, George Grosz, Stow Wengenroth, and others. Wellfleet was a popular summer destination for artists seeking a peaceful refuge from New York City, and their work would often reflect a distinct sense of pleasure and enjoyment of their surroundings. “The fine prints that they made in the summer not only reflected the charm of Wellfleet but also provide a fascinating view of how the area intersected with their artistic styles and values,” writes Gilbert. Thomas R. Broker is a Professor of Biochemistry and Molecular Genetics at the University of Alabama at Birmingham. Tom first came to Wellfleet in 1946, and the Broker Family cottage on Long Pond Road was built in 1952. This was the same year as Peggy Bacon’s extraordinary set of 28 dry point prints on the personalities and places of Wellfleet Village and also of Clare Leighton’s early wood block carving for her magnificent book “Where Land Meets Sea”, largely a story of everyday life in Wellfleet. Tom’s primary collecting interest is in the creative artistic process of preliminary sketches, finished drawings, and the working first impressions of plates, stones and wood blocks leading to the final states of dry points, etchings, lithographs, and wood block prints. 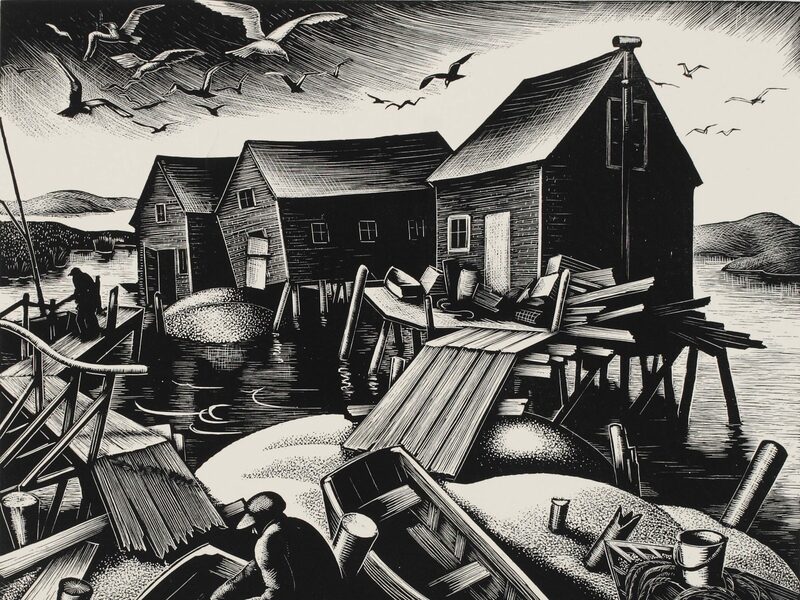 All of these are featured in this exhibition, the largest ever assembled of the mid-20th century print makers of Wellfleet, along with their work in Truro and Provincetown. Arthur N. Gilbert is a Professor of International Relations at the Josef Korbel School of International Studies at the University of Denver. He has been collecting prints for many years, and began exhibiting them in 2013 in Denver and in Wellfleet.